If you just mentioned “turkey meatballs” to me, I’d be sort of unimpressed, honestly. However, the “Hoisin-Turkey Meatballs with Glass Noodles,” from the July 2018 issue of Bön Appetit, pulled me in with the inclusion of cooked quinoa in the mix. Neat! 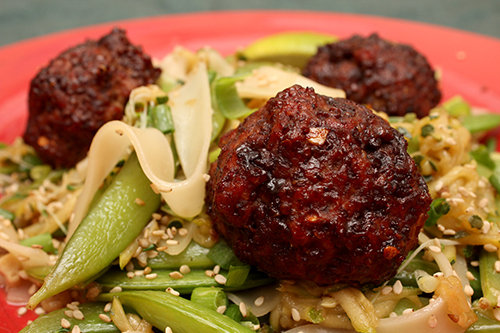 These meatballs are baked, which makes them far less intimidating than a messy fried meatball. Also, “glass noodles” are always a welcoming weeknight dinner idea. Quick and easy. Here’s how I paced my prep. Cook the quinoa and soak the rice noodles while I chopped the garlic and the ginger: some for the meatballs and some for the sauce. I formed 14 balls onto my baking sheet. Hoisin sauce (a current buzzword?) tastes like sweet ketchup. I keep a jar in my fridge like I do ketchup. Thanks to that sauce, these meatballs taste sweet and warm. Taste the ginger, too. Instead of mung bean sprouts, I tossed some alfalfa and radish sprouts into the stir-fried noodle mix. Nobody was hurt by this. Fun to assemble and eat. Go for it. Next time, I want to make the “Dukkah-Crusted Chicken with Lemon Hummus,” from Simply Recipes, since I’m a self-declared appreciator of dukkah. And I’m yearning to make some of my own hummus, too. Come back to my site next week, to share all this with me.